The landscape of the U.S. West Coast between Seattle and Los Angeles is some of the most beautiful in the world. It has the volcanoes of the Cascade Range, high deserts, ancient redwood forests, steep, forested coastlines, massive river basins, untamed wildlife, and the ebullient pioneer spirit of the west. The full glory of the Pacific Ocean states is on display when you travel from the West Coast from top to bottom, but you have to make the effort to see it. It takes a healthy two days on Interstate 5 to cover the 1,100 miles between Seattle and Los Angeles - one day for those in a huge rush. But if you slow down and skip the major highway route, everything changes. Here's an itinerary you will remember for a lifetime. Although you can't go wrong with the route as outlined below, there are so many ways to modify it that you should spend some time exploring what each area has to offer, extending a day here or shortening one elsewhere. Rent a car, drive one way and fly back, head back on I-5, or spend the return drive taking just as much time to explore the areas skipped along the way. One important note on this route is that the roads are all open during the winter. 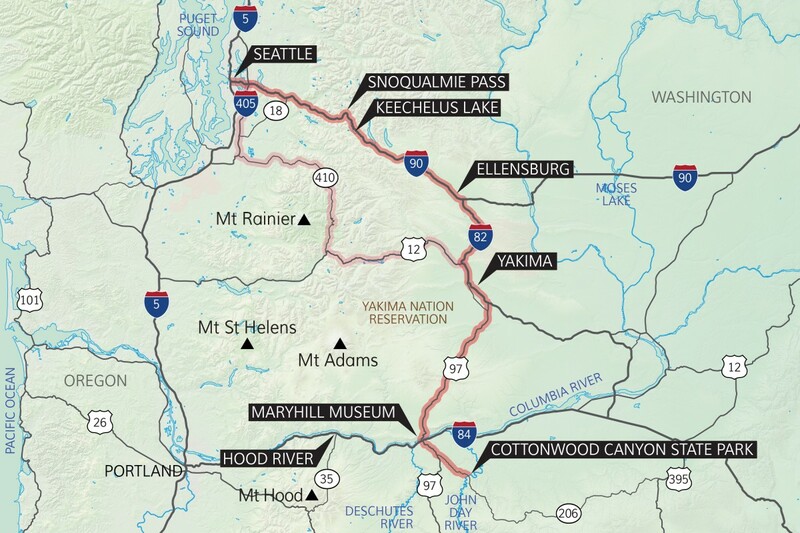 A summer trip allows for more route options, with snow-free mountain passes in Washington, Oregon, and California that would otherwise be closed. Unlike heading out of Seattle by taking I-5 South, heading east on I-90 quickly leaves the city behind. Snoqualmie Pass and Keechelus Lake provide a taste of the Cascade Mountains. The road north of Mount Rainier, a more scenic route to Yakima, is closed in the winter. 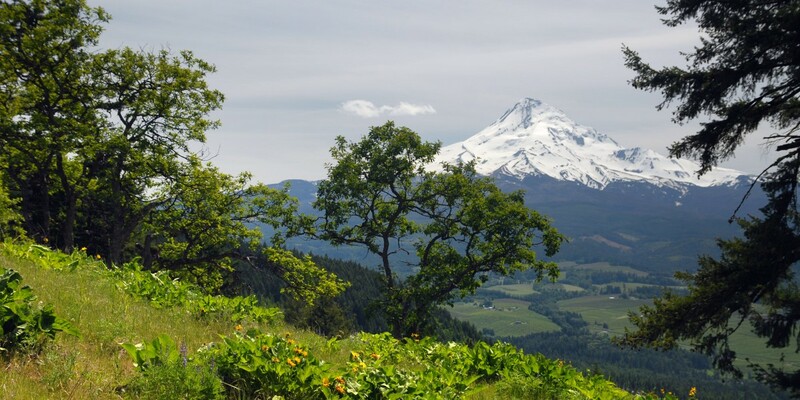 The landscape east of the Cascades quickly turns to farm country, and from Ellensburg into Yakima and on to Goldendale the road passes through the Yakima Nation Reservation, often with incredible views of Mount Adams to the west. Crossing from Washington into Oregon, the high plain drops down across the Columbia River. 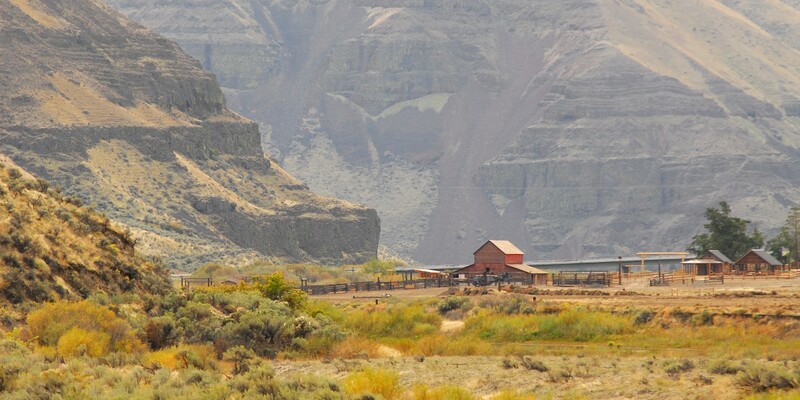 The detour from Oregon Highway 97 onto Highway 206 to Cottonwood Canyon State Park lands you at one of Oregon's newest campgrounds along the John Day River. Hike the trails leading along the base of the amazing canyon walls, and sleep under the stars for the first night of your journey. Lake Keechelus and the Cascade Range. Photo by Andrea Coan. Cottonwood Canyon State Park along the John Day River. Photo by Tyson Gillard. Sites to see along the way include a stop at Maryhill Museum or a break in Ellensburg for food. There are many alternate campgrounds on the Washington side of the Columbia River if you still want to camp but also shorten the trip. 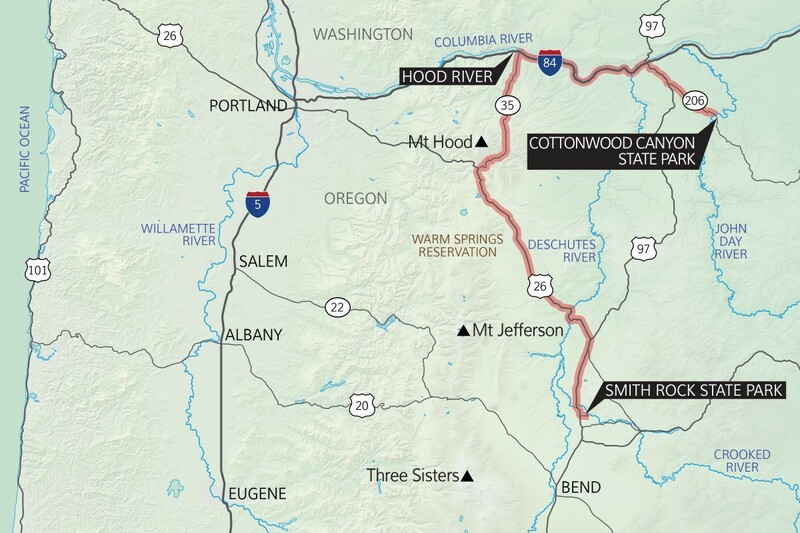 The next day's route backtracks slightly to Hood River, a great place to end the first day if you would prefer to find a hotel or B&B rather than camp. Search for lodging options including home rentals, B&Bs and hotels in Seattle, Yakima and Hood River. Return north and get a brief taste of the size of the Columbia River before arriving in the windsurfing mecca of Hood River for breakfast or an early lunch, depending on how much time you spend in the morning along the John Day River. 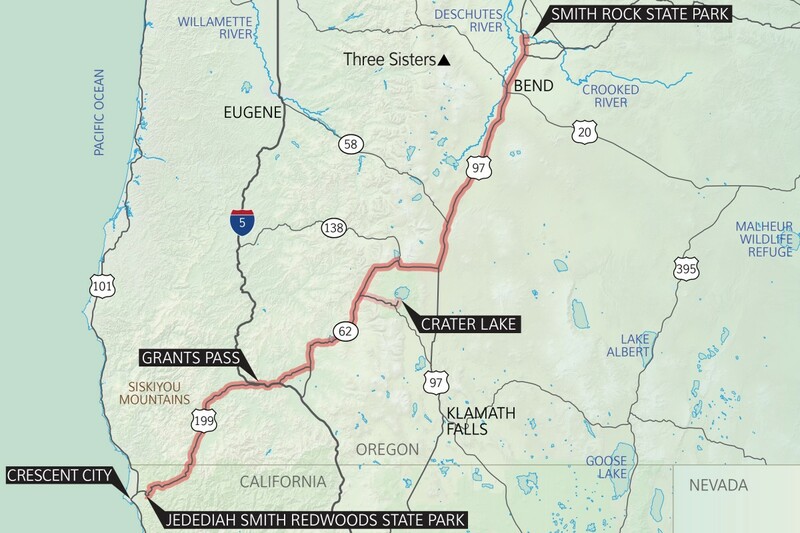 From Hood River, rather than continuing to Portland through the awesome bowels of the Columbia River Gorge, head south on Highway 35 to skirt the eastern edge of Mount Hood while continuing your journey south to Smith Rock State Park. Along the way the road passes through Warm Springs Reservation and provides constant views of Oregon's volcanic spine, and Mount Jefferson and the Three Sisters are hard to ignore. This is high desert at its best. If you can get to Smith Rock early enough, go for a hike or find your preferred climbing route, and grab a spot to camp along the Crooked River. Mount Hood from Bald Butte overlooking the Hood River Valley. Photo by Tyson Gillard. 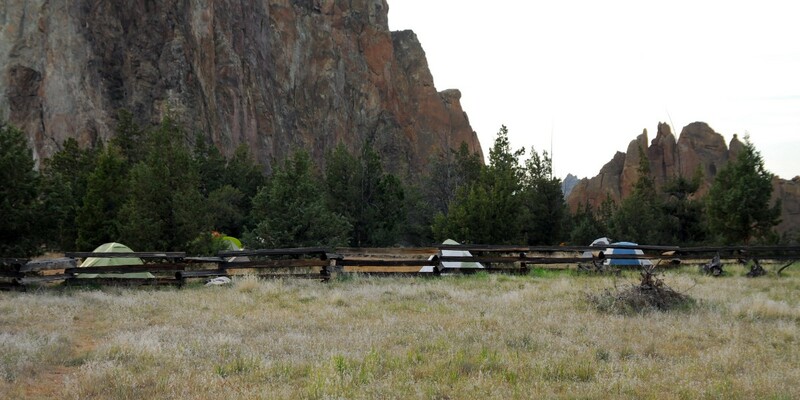 The campground at Smith Rock State Park. Photo by Tyson Gillard. If you've had enough camp vibes and you're in need of a hot shower, find a place to stay in Bend, 30 minutes down the road from Smith Rock State Park. Sunriver, a vacation community, is just a bit further south of Bend on Highway 97. Search for lodging options including home rentals, B&Bs and hotels in Hood River, Bend and Sunriver. Today is a long day that promises some of the most majestic sites of the journey. High desert roads lead to the mountains with a stopover at Crater Lake, Oregon's only National Park, before following crystal clear rivers to the redwood forests of Northern California. 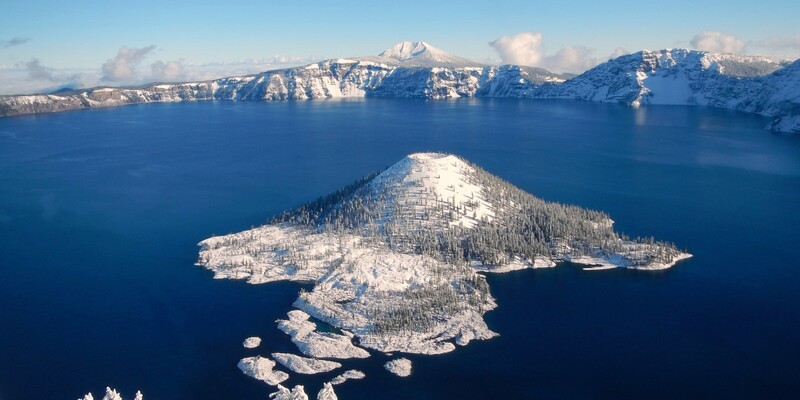 The trip to Crater Lake adds over an hour to the trip, but if you have the time, its deep blue water is one of the most impressive natural wonders to see in the state. Until May, the only way to get in is by way of the south road. From Crater Lake, cut through Grants Pass into the Siskiyou Mountains on Highway 199. 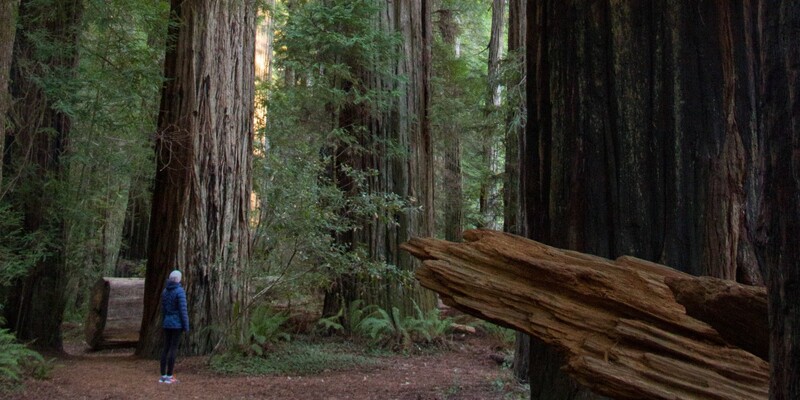 The day ends with camping under the impressive giant redwoods at Jedediah Smith Redwoods State Park. There are a number of other campgrounds in the area, so do some research and pick the perfect spot. Crater Lake seen from The Watchman in the winter. Photo by Jessica Beauchemin. Strolling beneath the redwoods at Jedediah Smith Redwoods State Park. Photo by Aron Bosworth. From the Jedediah Smith redwoods it's a short drive into Crescent City on the Pacific Ocean, so if you're day isn't complete without a view of the ocean, finish your journey here. You can also find places to stay in Crescent City if campgrounds are full or hearing the lapping of waves at night is your preference. Search for lodging options including home rentals, B&Bs and hotels in Bend, Sunriver, Ashland, Grants Pass and Crescent City. Hello famous California Highway 101 and the glory that is the California coastline. For the most part, the Pacific Ocean will be your companion for the rest of the trip. The 101 from Crescent City to Eureka and the Avenue of the Giants goes through some amazing stretches of redwood forest. Continue south on the 101 into Sonoma County to visit the area's towns and wineries. Healdsburg makes a great early lunch destinations. 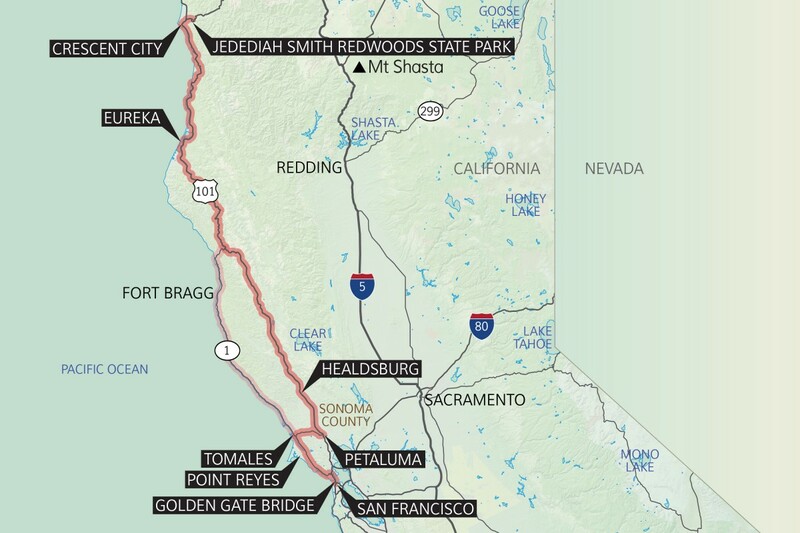 From Petaluma, head back west through Tomales to reach the Point Reyes Seashore and take the scenic route on Highway 1 into San Francisco across the Golden Gate Bridge. 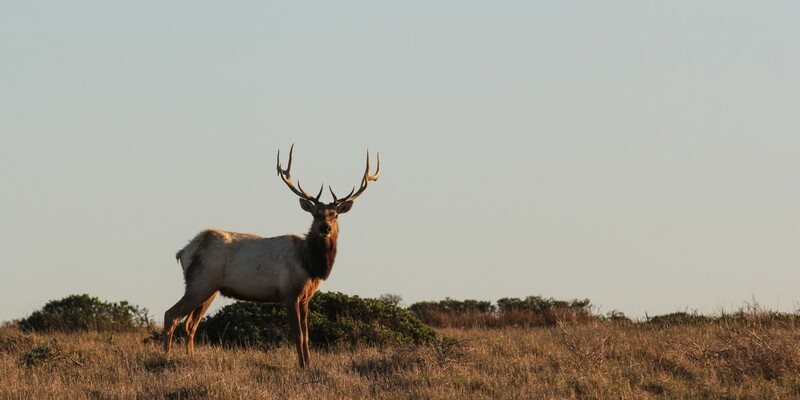 A bull tule elk keeps lookout on Point Reyes National Seashore. Photo by Aron Bosworth. 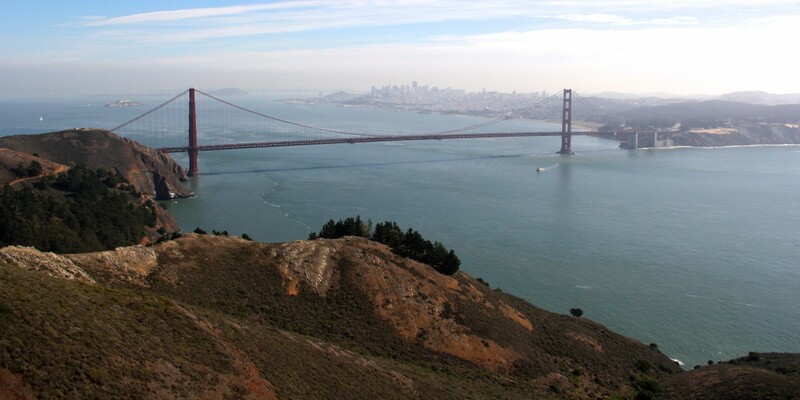 San Francisco and the Golden Gate Bridge from Marin Headlands. Photo by Aron Bosworth. If you want to shorten your day, find a B&B in Sonoma's wine country and enjoy an evening of fine food and wine tasting. Search for lodging options including home rentals, B&Bs and hotels in Crescent City, Eureka, Healdsburg, Santa Rosa and San Francisco. After a night and shower in San Francisco, hopefully with a good meal to go with it, continue south through Silicon Valley to Monterey. Stop for lunch along the bay either in Monterey or the quaint seaside town of Carmel-by-the-Sea before continuing on Highway 1 and the Big Sur coastline. 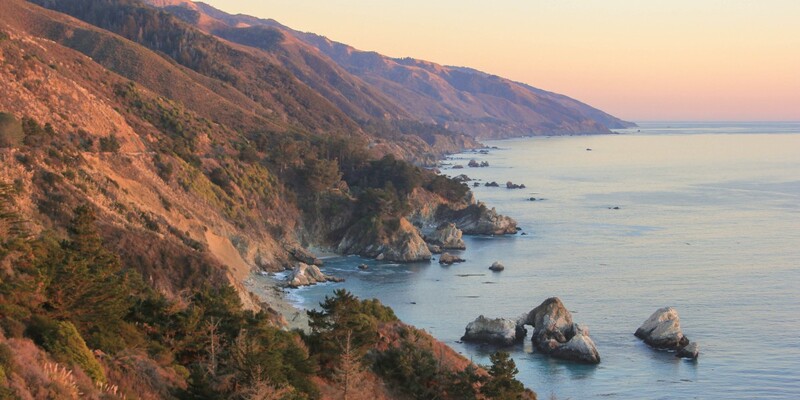 The road twists and turns with the ocean always to the west and Big Sur's forested mountains to the east. You'll want to take your time on this road and use the many pullouts to appreciate the amazing ocean views. There are many campgrounds in Big Sur, but if you can find a place near Julia Pfeiffer Burns State Park, you can choose to head into the mountains or watch the sunset over McWay Falls. Panther Beach to the north of Santa Cruz, along Highway 1. Photo by John Cody. Sunset along the Big Sur coastline at Julia Pfeiffer Burns State Park. Photo by Aron Bosworth. If you make an early start and want to avoid the congestion of commuters shuttling between San Francisco and Silicon Valley, stick to Highway 1 for the whole day's drive. It's a much longer journey along the ocean road, but it is worth it for the scenery. 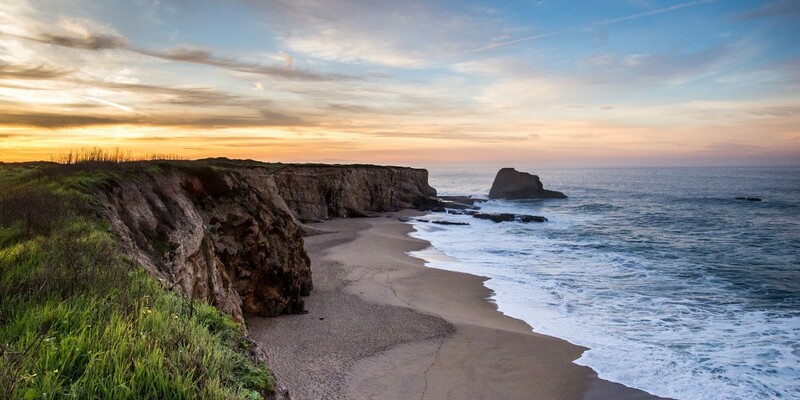 If you don't plan to camp, there are a number of options for hotels in Monterey and Carmel-by-the-Sea for the budget-conscious traveler, while the resorts of Big Sur are generally expensive. Search for lodging options including home rentals, B&Bs and hotels in San Francisco, Santa Cruz, Monterey, and Carmel-by-the-Sea. All good trips have to come to an end, but at least the last day can be just as spectacular as the first. Continue south on Highway 1 through Big Sur to San Luis Obispo. Along the way, consider stopping at Hearst Castle, the famous mansion built by William Randolph Hearst at the end of his life and the residence that inspired Xanadu in Orson Welles's film Citizen Kane. Stop for lunch in San Luis Obispo before returning to Highway 101 for the drive to Santa Barbara. Spend the afternoon enjoying the town and beaches of Santa Barbara or hiking through the hills outside of town. From Santa Barbara it's a short drive (depending on traffic) into Los Angeles. Walking down Sand Dollar Beach at the southern tip of Big Sur. Photo by Aron Bosworth. 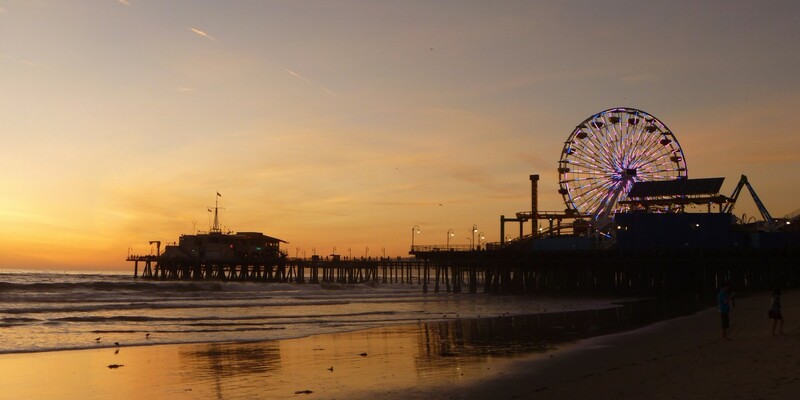 Evening at the Santa Monica Pier. Photo by Shane Kucera. And so ends an unforgettable road trip and the inevitable sinking feeling that comes with knowing you're headed back home. But it doesn't have to end if you have the time and the will. 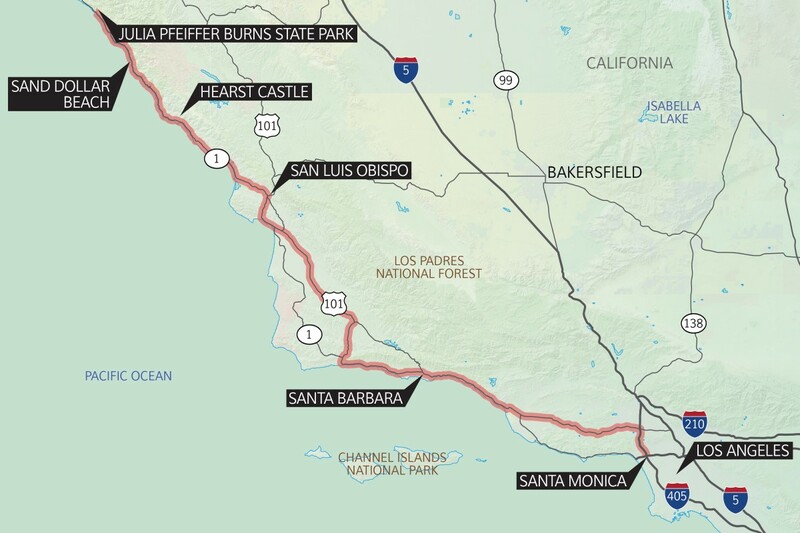 Continue east to Joshua Tree National Park or south along I-5 to San Diego, and from there the route is up to you. 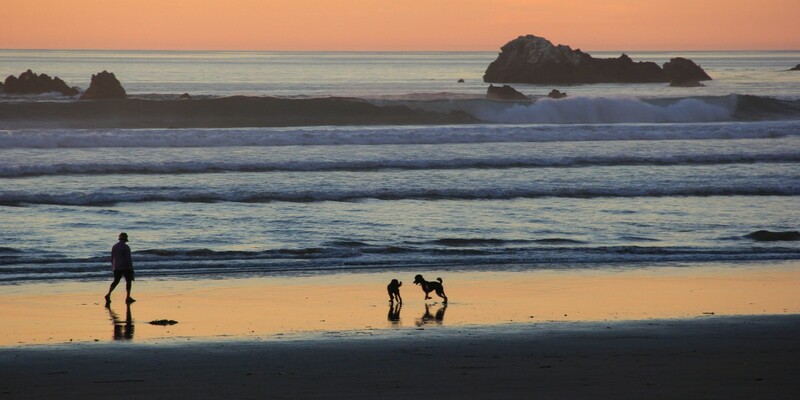 Search for lodging options including home rentals, B&Bs and hotels in San Luis Obispo, Santa Barbara, and Los Angeles. It's up to you where you go and for how long, as there is no right or wrong way to adventure through the west coast on wheels. Just make sure to have fun with it! Why not end the journey in San Diego? On Day 5, there are only two good route choices to go between San Francisco and Silicon Valley. Highway 1 is slow, winding and scenic, as noted, but no site should advise Highway 101 as the faster alternative. Highway 280 is faster, less congested and almost as gorgeous as Hwy 1. 280 has every advantage over 101: every Bay Area resident knows this.. Unfortunately, a bridge on Highway 1 in Big Sur suffered support failure and had to be destroyed. There is currently no way to travel south of Big Sur. There is no date given for replacing the bridge. 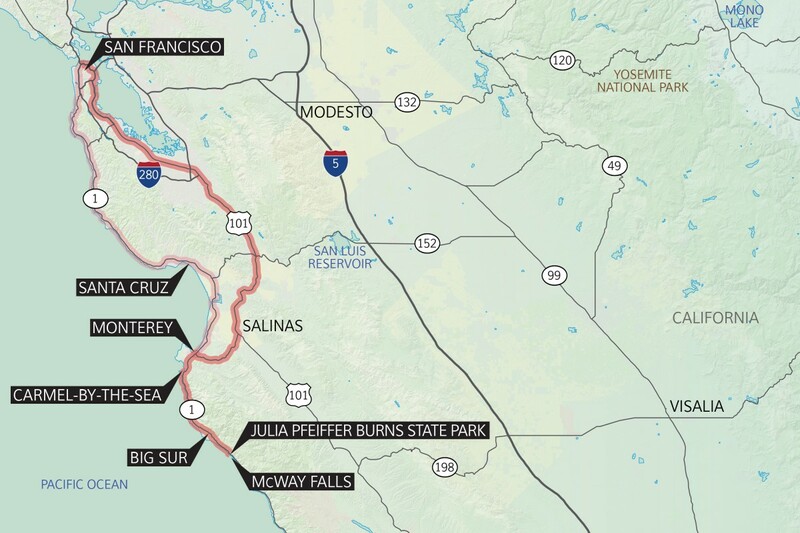 You must take Highway 101 south from Salinas to Paso Robles to get to San Simeon.